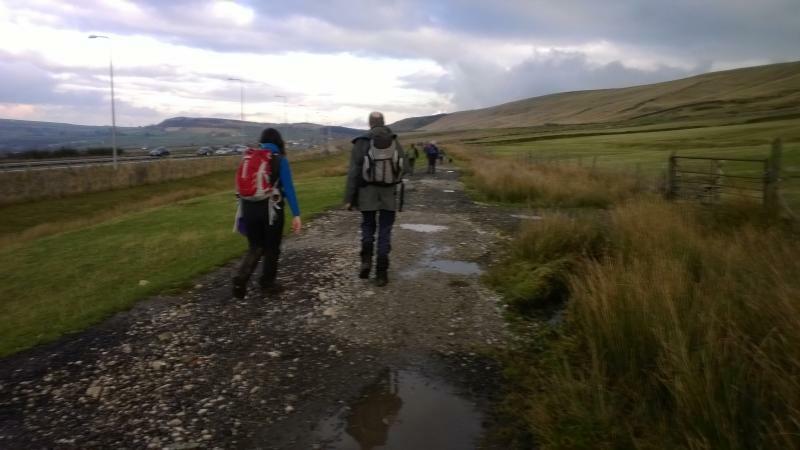 East Lancashire LDWA - New Year's Resolution - Get Walking! I start by apologising for under-estimating the original distance of the walk. I had it as 20 miles then thought it was 22 miles. By the time we has finished it was 23 miles. Oops. I had pre-warned it would be a late finish in an email beforehand and it didn’t put walkers off! 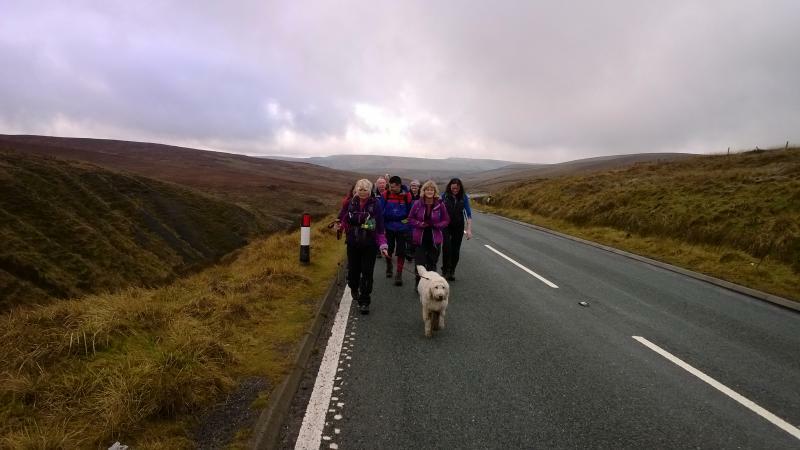 20 walkers and 3 dogs set off from Littleborough Railway Station heading to Marsden Railway Station (the Station to Station part of the route). 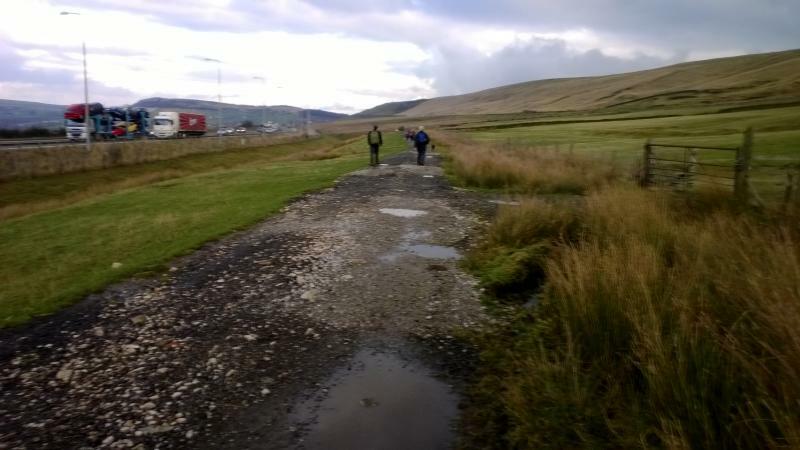 This is a ten mile section via Ogden and Rapes Highway to Tunnel End and then the Huddersfield Canal to the Station. The weather was seasonally warm and bright. Lunch was taken above Marsden with views stretching towards Castle Hill. The afternoon section of 13 miles was over harder terrain and the pace did drop. Dean Head Reservoir was a tough climb. The M62 was crossed at Stott Hall Farm (known on BBC travel has the Little House on the Prairie). The last climb of the day up to Blackwood Edge Road from Booth Wood Reservoir coincided with colder conditions and the group began to stretch out. We managed to get off the rough ground before dusk and walked along the pavement from below the White House into Littleborough. Some 8 Plodders gathered for the first Plodder Walk of 2014 at a lay-by on the A59 near the Tickled Trout. Taking two cars, we headed for Ambleside and the steep path towards Stock Ghyll waterfalls. Passing the first sighting of the aqueduct, and encouraged by the lack of rain, we headed up the ghyll to the path and footbridge across the ghyll. Once across, we headed back down towards Ambleside crossing over the aqueduct and noting four gates, two of atypical design. Unfortunately our 'Gate Inspector' was not with us to confirm our findings. 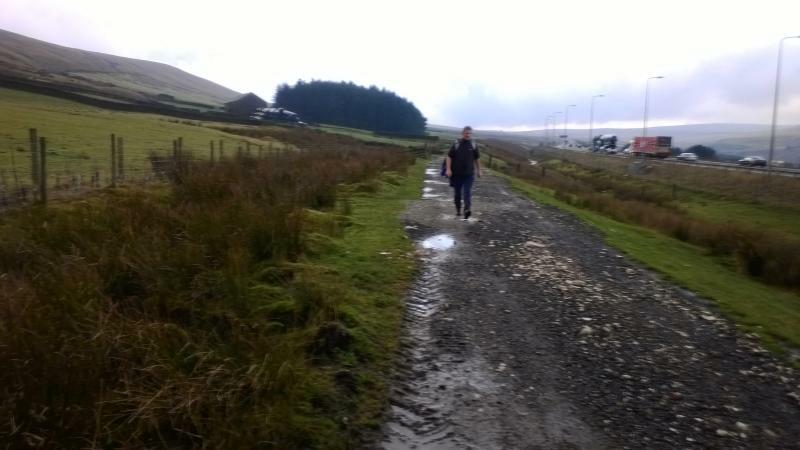 Galloping downhill, we headed for the University of Cumbria Campus and took the road leading to Low Sweden Bridge. Crossing the ghyll, we followed the raging waters down to the bridleway to Rydal. Hurried on by darkening skies, we reached the café at Rydal just before a very heavy downfall. Rydal Hall was built for the Le Fleming family in the 18th century and is now used as a retreat home. Rydal Park is used as a Scout and Guide camp site and also for local sheep dog trials. Enjoying coffee/cakes and missing the rain, we put on our waterproofs for the walk along the Coffin Trail to Grasmere. Of course the rain stopped and we took a further lunch break at a delightful spot overlooking Rydal Water. Pushing on, we spotted the aqueduct passing between hillsides at Nab Scar. The A Team climbed up to inspect the aqueduct, making use of a public path leading straight to the top of the aqueduct. A very similar finding to the one at Michael's Fold, where the aqueduct emerges from the tunnel, blasts through the rock and passes over the Ghyll and into the opposite hillside. This tunnel was the shortest of the three aqueduct tunnels and the first to be completed. Passing the bungalow used by the Senior Aqueduct Engineer, we passed White Moss Common, which was the headquarters of Thomas Vernon and Company, the number one contractors on the aqueduct. The common was covered with wooden huts and offices and a large number of workmen lived here in temporary accommodation. Despite their rough appearance, the navvies were hard-working, honest and well-behaved. The 'locals' did very well out of them, especially the landlords of the Ambleside pubs! Finally reaching Dove Cottage and Grasmere, we had only five minutes wait for the bus back to Ambleside and the steep climb back to the cars. Finishing at 3.30pm in pleasant afternoon sunshine, The Plodders were very happy with their first walk of 2014. 14.8 miles. 22 walkers and 2 dogs. Leaders: June Reeder, Hilary Scott. The Weather Gods were kind again on this second leg of the Monastic Way. With New Year walking resolutions to the fore a goodly crowd assembled at Parbold; taking over the canal side car park and including Colin who had driven all the way from Telford to join us. Off we went at a smart pace along the canal, the ground was much muddier than the recce before Christmas. Reaching Moss Bridge we turned off the canal; (Leeds was 101 miles away) and made our way via track, road and fields to the Lathom House estate. Morning coffee was taken by the lovely old chapel and almshouses there with good views to Parbold Hill. After a photo call with Lathom House in the background we followed Cranes Lane past Ormskirk Golf Course. Detouring through fields we came to Abbey Farm Caravan site passing the base of a wayside cross at the entrance. We then admired the remains of Burscough Priory which are in a private garden but could clearly be seen through the bare trees. It was then along to an old landfill site – no smoking here please! Passing the church of St John the Evangelist we made our way across fields to a nature reserve with many named meadows and on to the road. Passing another cross on Hobcross Lane it was a short walk to rejoin the canal at the Ring o’Bells pub. Leeds was 102 miles away, we had just walked an extremely long mile! Lunch was at Top Locks where we left the main Leeds Liverpool canal to follow the branch to Rufford. The turf cutting machine was busy as we passed – anyone for a new lawn? Leaving the canal at Prescott Bridge we crossed Wham Bridge and turned off on the ditch side to a lonely barn. The next field known as Low Meadows was holding a lot of water, lots of quick jumps over was needed to avoid the worst. We came to a bridge over the River Douglas and after the obligatory “Good Afternoon Dougie” chorus it was just two people at a time over this swaying structure. There were two hares playing in a field ahead which provided entertainment whilst we waited for everyone to cross. We avoided the busy road leading back to Parbold by turning and following country lanes through Bispham Green, no sign of the sea here though! The final stretch back into Parbold was through fields and woodland, the first sign of rain was in the air and we nearly lost John Pickton on a turn-off. Luckily he found us again! The leaders ended up on nil points. We gained points because there were a lot of paths that we had not been on before, some interesting features to look at and good weather. We lost them all for muddy ground, not asking Norman to be official back marker and nearly losing John. A better result than the previous walk's minus 20 points! Hey Ho, onto the next part……….